Operators can view pre-configured feeds from various sources and drag-and-drop desired posts to a customised list. After months of testing and field trials, PlayBox Technology is set to release a full production version of its SocialMediaBox, which allows comments from multiple web sites or social networking feeds to be processed quickly and efficiently into a single ready-for-broadcast stream. The system is available as a standalone solution or integrated with the company’s TitleBox channel branding system. Don Ash, PlayBox Technology Managing Partner and Director of Sales, said that due to the growth of social media services, both in number and popularity, products like the SocialMediaBox have become critical to broadcasters’ workflow and maintaining viewer engagement. SocialMediaBox is controlled using a standard web browser. Operators can view preconfigured feeds from various sources and drag-and-drop desired posts to a customized list. Comments in the newly created feed can then be edited, checked against a profanity word list and published immediately or floated until approved for publishing. SocialMediaBox is a new PlayBox Technology client/server application using SQL-based data storage and supporting multi-user access as well as multiple outputs. 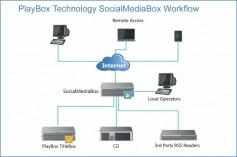 A single SocialMediaBox account can be deployed across several television shows and channels. Multiple user accounts can be assigned, each account then being able to create customized feeds. Access to each feed can also be configured as private, accessible by designated users or available to all users. PlayBox Technology, which now supports over 15,000 TV and branding channels with its playout server and channel branding technology, will exhibit the new SocialMediaBox application at the 2015 IBC Show (stand 8.B70).